Pirates’ lair, settlement for British loyalists, haven for rum runners—lots of facts about the Bahamas may surprise you. Most visitors to the Bahamas just see the country as a place to relax and escape the daily grind. These facts about the Bahamas begin to describe a group of many islands, both large and small, with a rich history tied both to the United States and the Caribbean. The Bahamas are an independent nation consisting of an archipelago of about 3,000 coral islands, cays, rocks, and reefs. The islands extend for approximately 500 miles (800 kilometers), starting about 50 miles off the east coast of Florida and reaching nearly to the northeastern tip of Cuba. Despite the huge number of islands and cays, people inhabit only about 20 of them, and most Bahamians, more than four-fifths, live on two islands, New Providence and Grand Bahama. The capital, Nassau, also to the largest city, lies on the northern coast of New Providence. The natural beauty and mild climate of the Bahamas have made the country an attractive tourist destination, especially for visitors from the nearby United States. Although many parts of the islands are now dotted with modern resorts, pools, and golf courses, many facts about the Bahamas are fascinating. Did you know that the first Governor General of the Bahamas, Woodes Rogers, was a privateer? Or that after the American Revolution, many British loyalists moved to the Bahamas with their slaves? Blacks make up about four-fifths of the population, many of whom are descendents of slaves brought to the islands by British loyalists who left the United States after the Revolutionary War in America ended in 1783. The rest of the Bahamian population consists chiefly of whites and persons of mixed black and white ancestry. The Bahamas have a mild climate. Temperatures average about 72 degrees F (22 C) during the winter and about 85 F (29 C) in the summer. An average of about 45 inches (114 centimeters) of rain falls every year. The Bahamas consist of nearly 700 islands and about 2,300 rocky islets and reefs. 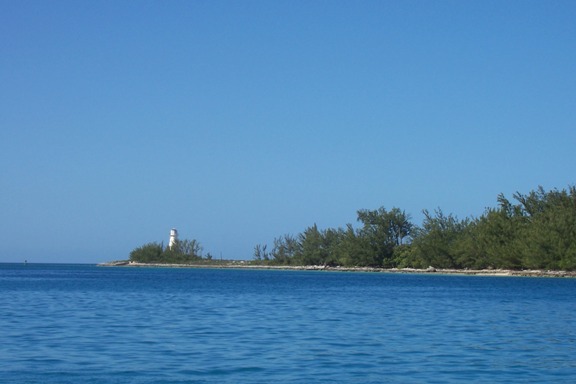 The principal island include Acklins, Andros, Cat, Eleuthera, Grand Bahama, Great Abaco, Great Exuma, Great Inagua, Little Abaca mew Providence, and San Salvador, most of the Bahamas are long, narrow strips of limestone covered by a thin layer of stony, infertile soil, Pine forests, rather than palm and coconut trees, cover part of the islands. In 2007, the Gross Domestic Product (GDP) was $7.233 billion, making the per capita GDP approximately $16, 460. The chief natural resources include salt, aragonite, timber, and arable land. The main industry is tourism, which accounts for 60% of the GDP when combined with tourism-driven construction and manufacturing. Financial services provide more than 10% of the GDP, while manufacturing, agriculture, and fisheries represent less than 5%.